This work is a clinical manual integrating traditional Chinese acupuncture with Western orthopedic and sports medicine. Using a simple four step approach, it outlines the diagnosis, assessment, and treatment protocol for 25 common sports injuries, offering both insight and method for treating injuries and pain. Point selection and needle technique is made simple, logical, and systematic. Coverage includes common conditions such as plantar fasciitis, rotator cuff tendonitis, and arthritis of the knees and hip. Diagnosis and assessment is summarized from both Western and Chinese medical perspectives. 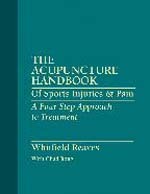 There are detailed illustrations and descriptions, and treatment protocols that include trigger points, motor points, and other needle techniques not commonly discussed in standard acupuncture texts.